Southern rust (Figure 1) has been confirmed in samples from Clay, York, and Greeley counties. These samples were from fields that had low incidence of disease at this time. The disease is likely more widespread than these counties and so scouting is necessary to determine its distribution in your fields and area. UNL Plant Pathologist Tamra Jackson-Ziems discusses how to differentiate between common rust and the more aggressive southern rust. 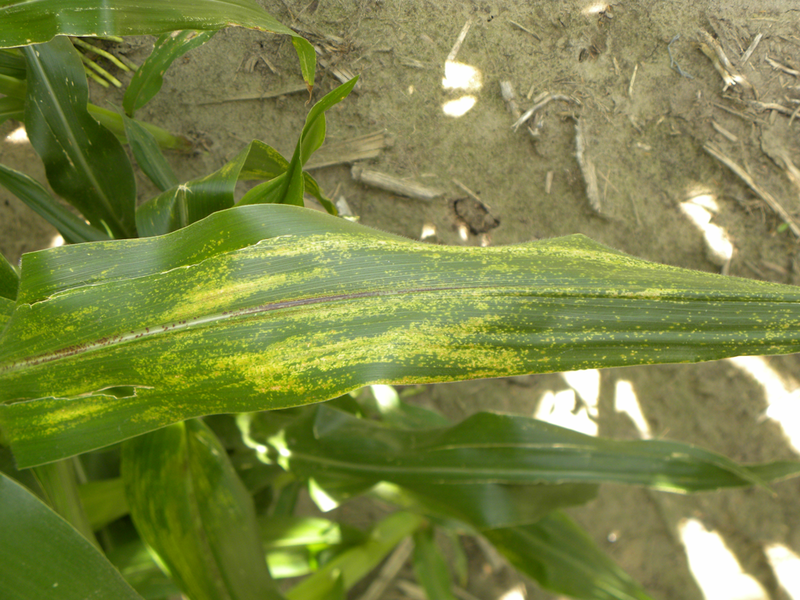 Warm temperatures and high humidity may promote development and spread of this disease. Rust diseases produce large amounts of spores that can be easily moved by wind for long distances. The fungus can quickly cause disease during favorable conditions because most commercial dent corn hybrids have no resistance to the disease. Having a history of southern rust in corn does not have any impact on disease development now, because this pathogen does NOT overwinter in infected residue. The spores must be carried into the area on winds from diseased areas. Southern rust has been confirmed across most of eastern Kansas and other states to our south. If the disease continues to spread and worsen in Nebraska, those fields planted later are at highest risk for disease and potentially severe yield impacts because of how early the disease is developing. However, it is important to remember that it can take anywhere from a few days to several weeks for widespread and severe southern rust to develop if it is going to do so. For that reason, we recommend scouting fields, especially those at higher risk, such as later planted fields. A number of people have pointed out the lack of activity on the national southern corn rust ipmPIPE monitoring website, which historically tracked observations of southern rust across the country. Federal funding for this website and its affiliated southern rust monitoring projects was eliminated and so activity there by state pathologists has greatly declined during the last two years. Thus, maps on the website may not be as current as they once were and should not be strictly relied upon. Refer to reports from university plant pathologists, diagnostic laboratories, and county Extension offices for the most recent information regarding southern rust distribution. The characteristics used for differentiating between common rust and southern rust are described and illustrated in the NebGuide, Rust Diseases of Corn in Nebraska. The simplest and most reliable way to differentiate the diseases without a microscope is to examine both leaf surfaces for spore production. Southern rust spore production is usually limited to the upper leaf surface and tends to be tan/orange in color. The most reliable method for identifying corn rust diseases is based on examination of microscopic spore characteristics. This can be done for samples submitted to the UNL Plant and Pest Diagnostic Clinic. Common rust has been developing across Nebraska for several weeks (Figure 2). Common rust spores are usually brick-red to brown in color, however, the color difference is not a reliable method for identification when both are not available for comparison and because the spore type can change and turn black later in the season for both diseases. 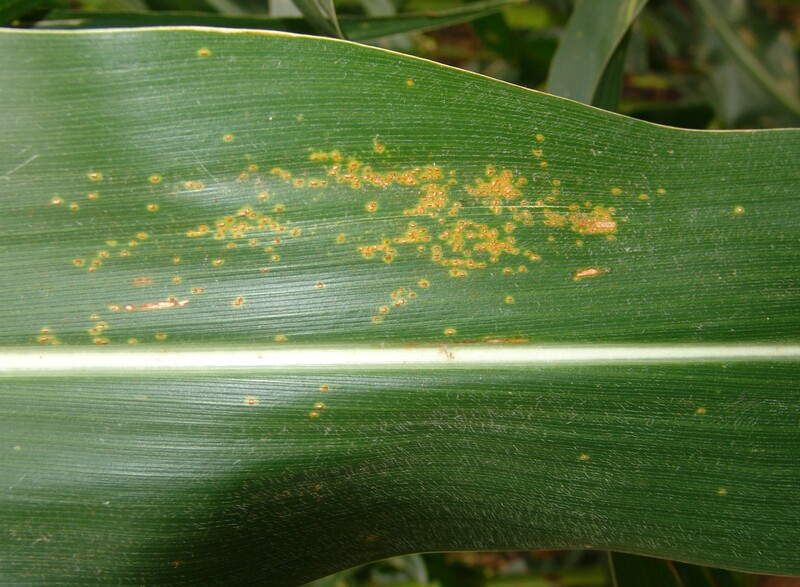 Common rust spores can be produced abundantly on both the upper and lower leaf surfaces. Common rust is usually not a substantial threat to plant health and corn yield, as many contemporary hybrids have some resistance that slows spread of the disease. 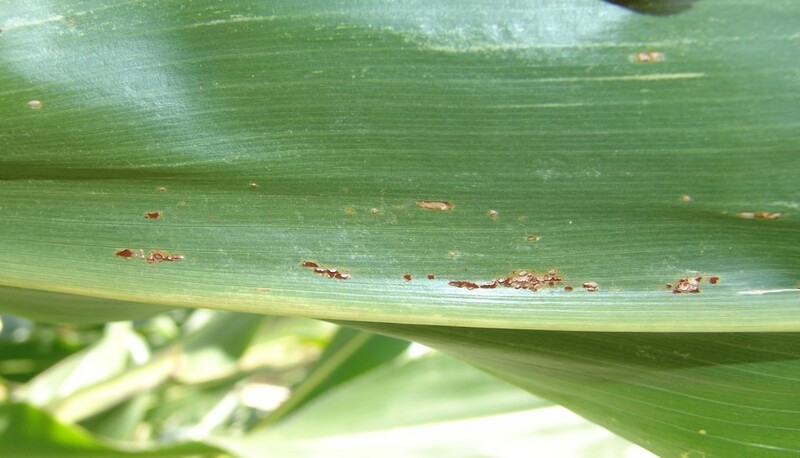 Timely fungicide applications can be very effective in controlling rust diseases in corn. It is important to remember that if fungicides are applied too early, their protection may be gone before substantial southern rust develops, leaving plants vulnerable to infection again. Keep in mind that systemic fungicides can provide protection from disease spread for about 21 days, so application timing is very important to make the best use of the protective and curative characteristics of the products. Applications made several weeks ago are likely no longer providing protection from fungal foliar diseases. Pay close attention to the label restrictions on the most recent version of the product's label as changes have been made for pre-harvest intervals and other use parameters. A list of foliar fungicides labeled for use on corn in Nebraska and their characteristics is available in the 2015 Guide for Weed Management with Insecticides and Fungicides. Results from corn foliar fungicide trials conducted in Nebraska are available on CropWatch. These results were gathered from trials with natural infestations of gray leaf spot and sometimes mild southern rust. Another disease that has begun to develop in Nebraska corn fields is Physoderma brown spot. This disease is normally not a concern, except in rare cases, such as on susceptible hybrids exposed to wet conditions. However, the yellow lesions on the leaf blade may be misleading for some people who mistakenly identify it as southern rust. The pathogen causing Physoderma brown spot requires standing water on plant parts, so lesions can develop in a banding pattern across the leaf after they emerge through the plant's whorl during alternating wet/dry periods. Lesions may develop in both the midrib and on the leaf blade with very different appearances (Figure 3). On the leaf blade, the small yellow/brown lesions may be alarming and appear similar to southern rust pustules, but lack the colored spores on the surface that can be wiped away. Lesions that develop in the midrib are often larger than those on the leaf blade and are usually black. The pathogen overwinters in infected corn residue from previous seasons. Management of Physoderma brown spot is rarely necessary. The UNL Corn Disease Profiles can be helpful in differentiating numerous leaf diseases. Similarly, a recent update from Iowa State University on Physoderma brown spot is helpful. Check the Corn Disease section in CropWatch Plant Disease Management for information on specific diseases.